Volunteer service to CSUN begins, in many cases, with one spark. Armen Haroutunian ’13 (Finance), 26 years old and five years removed from earning his bachelor’s degree at CSUN, was at a post-work meetup with a friend one night. The friend, a fellow CSUN alumnus, brought along a co-worker who also earned his bachelor’s degree at CSUN. That co-worker, Ben Gary, pitched Haroutunian on joining the board of CSUN’s Finance, Insurance and Real Estate Alumni Chapter. Haroutunian joined, and despite working full time and going to classes to earn his MBA, he has found time to give back to CSUN and its students through volunteering, including mentoring students. “Why would I not be involved in a school that’s been home to me?” Haroutunian asked rhetorically. 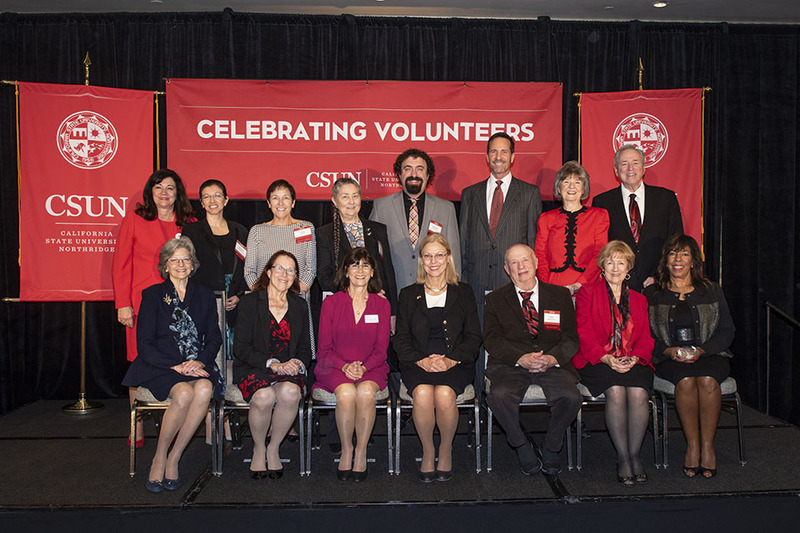 To honor Haroutunian’s dedication to the university, CSUN celebrated him and 28 other volunteers at the 17th annual CSUN Volunteer Service Awards on Nov. 30. Haroutunian was recognized in the Chapter category, an award given to those who have gone above and beyond to elevate CSUN through its alumni chapters. Others were honored by colleges and programs in the University category. 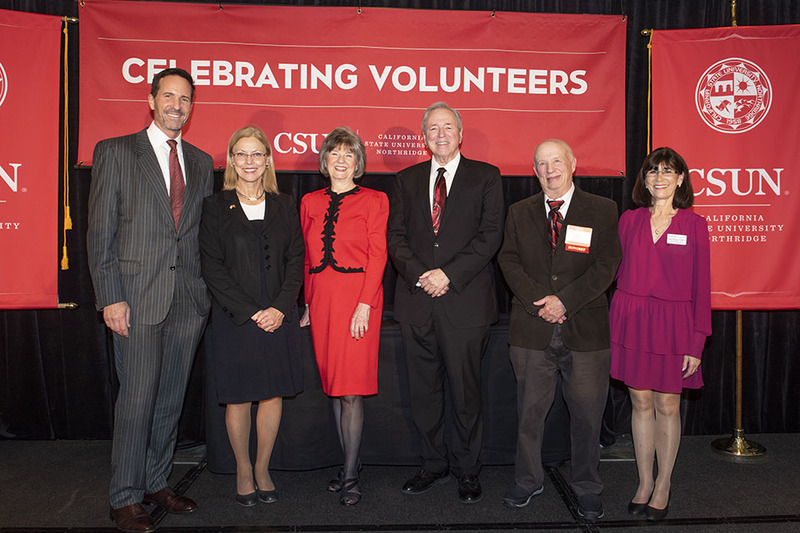 CSUN also awarded its three highest volunteer service honors — the Dorothea “Granny” Heitz Award for Outstanding Volunteer Leadership to Earl Enzer, the Dean Ed Peckham Award for Emeritus Service to Steven Oppenheimer and the CSUN for Life Award to Bonnie Faherty and Edward Feldman, given to non-alumni who have championed the university. Enzer ’83 (Finance), a managing director in the Private Wealth Management Group of Goldman Sachs and former chairman of the CSUN Foundation Board, helped elevate the university during one of the most prosperous periods in its history, a time where fundraising, alumni engagement, and reputation and visibility have risen. He joined CSUN’s Foundation Board of Directors in 2001 and served on it until 2018. He was chairman from 2009-16 and helped provide a new structure and level of expectation on the board. His energy, ideas and follow-through invigorated the board and led to action, as well as alumni and community engagement. Enzer headed the group of leading alumni and community volunteers who oversee the management of the university’s philanthropic assets and encourage people to invest in the university. Along with former Hawaii Gov. Linda Lingle, he co-chaired the Special Task Force on Engagement, helping to provide the university with a roadmap to better engage alumni and garner community support. Under his leadership, the board also supported the university in its efforts to create a cohesive look and messaging, building a new identity that better represents CSUN. 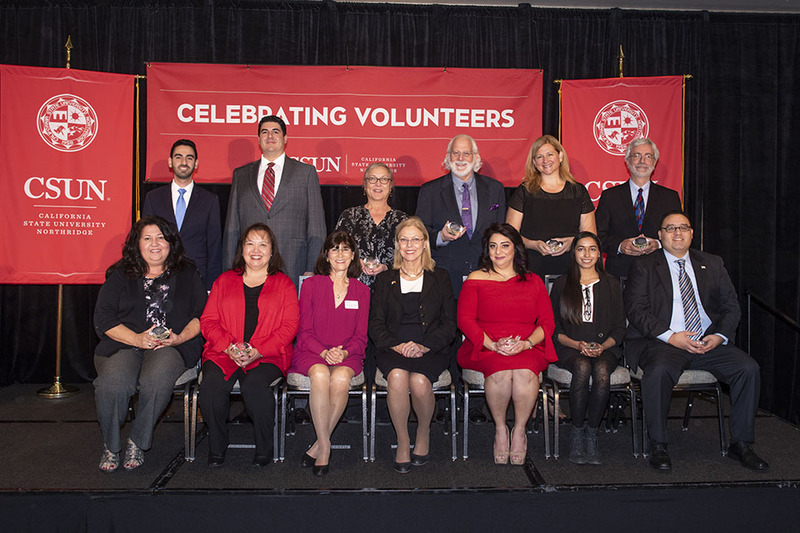 During his acceptance speech at the Volunteer Service Awards, Enzer spoke about his desire early in his professional career to help CSUN and the joy he has experienced in giving back to his alma mater. Influential educator, cancer researcher and CSUN stalwart Steven Oppenheimer has impacted countless lives through not only his research, but the education and mentorship he has provided thousands of students — many of whom have gone on to make their own impact. Oppenheimer began teaching at what was then San Fernando Valley State College in 1971 and has received dozens of accolades in his five decades of teaching, including one of the highest honors in the country for an educator. On Jan. 6, 2010, he was honored with the U.S. Presidential Award for Excellence in Science, Mathematics and Engineering Mentoring, and he received the award from President Barack Obama at the White House. He also had the opportunity to meet with President Obama and the President’s Council of Advisors on Science and Technology about issues in science and education. Oppenheimer deflected the attention to others in his acceptance speech, first recalling the university’s achievement in 2016 of being named by the journal Nature as one of North America’s top 25 institutions for science. Faherty has earned four academic degrees, and Feldman has two — all from universities outside of CSUN. However, they have taken CSUN into their hearts and have been devoted to serving the university, particularly its Department of Nursing and the Office of Government and Community Relations. Faherty taught at CSUN from 1997-2001 and later was awarded a Volunteer Service Award from the Nursing Alumni Chapter in 2008. She is an associate professor emeritus in CSUN’s Department of Health Sciences. Faherty and Feldman are members of The Dean’s Circle for the College of Health and Human Development, and both are members of the President’s Associates. Together, they have given to students, CSUN’s Department of Nursing, The Soraya and the Delmar T. Oviatt Library, among other areas on campus. “Why would you give anybody an award for doing what they love?” Faherty asked the audience as she accepted the award.